2016 Aprilia SR 50 R. Picture credits - Aprilia. Submit more pictures. 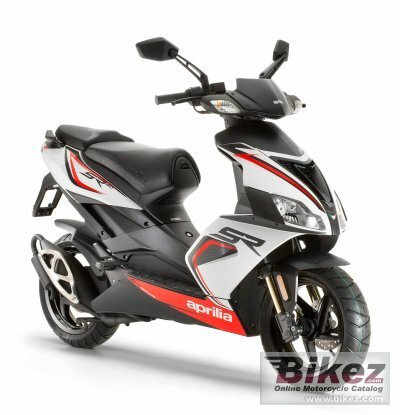 Finish and details borrowed from maxi bikes eg., mirrors, integrated footrests, brake pumps in view, not to mention superior equipment such as large and comprehensive digital dashboard and twin halogen headlights, motorcycle-type electric blocks, always with particular focus on safety. Rear suspension: Engine unit acting as swingarm. Monoshock. Ask questions Join the 16 Aprilia SR 50 R discussion group or the general Aprilia discussion group. Bikez has reestablished Bikez.info motorcycle web shop overview. Here we present the major online shopping possibilities for motorcycle parts, gear and accessories. This includes customizing and insurance. Search and compare products and prices. Try our 2016 Aprilia SR 50 R discussion forum if you have questions or comments. Information about any technical issue is always welcome.